I’ve always admired the eastern redbud tree for its beauty and as a harbinger of spring. When its gorgeous red/pink color decorates our backyard and neighboring forests, I know I can start to pack away the sweaters until next fall. This past weekend, though, I learned a few more interesting facts about this tree. For one thing, the flowers are edible. On the PEC hike yesterday, our guide Scott educated us about a variety of edible plants in the forest (in addition to the mushrooms that we were hunting). I tasted a small handful of the flowers and found them not unpleasant. The flowers contain anthocyanins, an antioxidant, that in some circles are believed to prevent cancer and other ailments. 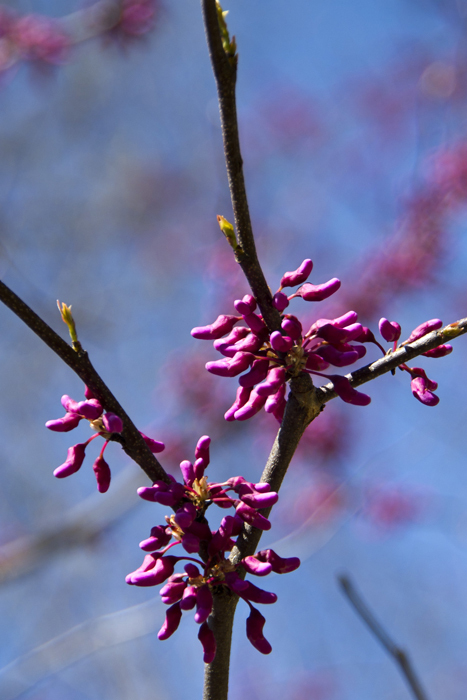 Some Native Americans used to eat redbuds raw and boiled as part of their spring diet. This redbud in our backyard is safe, though, for after tasting it I’d rather admire it from a distance and save my antioxidant intake for the upcoming spring strawberries.